Tuna melts use to be a staple in my college dorm. One cup mayonnaise, a little tuna, and say the word "green" and you had lunch! As you age, you learn a few things. For example, ketchup is not a vegetable and mayonnaise should be used sparingly. Does anyone else remember PBS featuring a song on "Drowning your food"? For this tuna melt, I have used only a tablespoon of mayonnaise. Some of you might be wondering why I don't use more of a light mayonnaise to make it creamier. I did buy and write about light mayonnaise and my conclusion was that it didn't taste very good. Hellmann's used starch to thicken the product and it was just awful. I threw out the jar without finishing it. So, I made a new rule. None of Snack Girl's recipes will have light mayonnaise as an ingredient. I don't care how many samples they send me - it is NOT going to happen. What is special about THIS tuna melt is that it is packed with protein, 43% of your daily value of vitamin A, 129% of your daily value of vitamin C, and 6% of your daily value of iron in ONE half of a bell pepper (gluten-free, too). 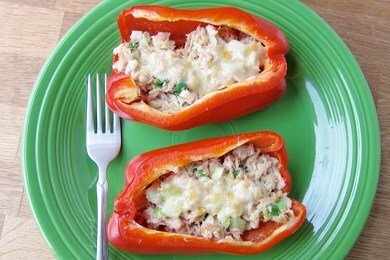 When you heat it under the broiler, you get a hot cheesy tuna taste and a warm crunchy sweet pepper taste. It is so fresh and lively that you won't miss the bread. My husband ate these for dinner and told me that he loved me. See what good food can do? I had a few left over so I put them in a container for lunch the next day. These are great to bring to work and then heat up for about 20 seconds in a microwave (or eat them cold). You don't need a fork or knife - just grab them like a sandwich. Red bell peppers can be expensive. I was able to find some for $2 per pound and I was psyched! Spend a little less money on vitamin pills and more money on food like red bell peppers. Have you lightened up a tuna melt? Please share. What r ur thoughts on Miracle Dressing-I have never in my life used full mayo or lite mayo, always lite Miracle Whip. How clever. Can't wait to try this one. I may add a diced fresh jalepeno because a SPICY tuna melt sounds delish-ous! Thanks for the idea. ooo, great idea from the poster above me! Adding jalepenos would kick it up a notch! I like to use non-fat plain Greek yogurt in place of mayo or sour cream in recipes. It usually turns out great with less fat and calories without compromising taste. 1 WW Point+ per tablespoon. Greqat idea! Can't wait to try it! Yummy! I love that you used a pepper instead of bread! Great recipe!! Lisa these sound really good... Going to try them for lunch.. Plain, whole milk, Greek yogurt is a good substitute for mayo. I like my tuna creamy, so I add a little dijon mustard in addition to the mayo. It adds a bit of tang for hardly any extra calories and 0 WW pts plus value. I never thought of adding greek yogurt to tuna - I'll have to try that. I usually add mustard and mayo and don't drain the tuna until it's really dry - leaving some liquid helps (I always buy tuna in water). I also grate up carrot to put in tuna sometimes. @Robin - Best Foods and Hellman's are the same thing. It's one of those weird things companies do - like Arnold Bread is Orowheat on the west coast and Edy's ice cream is Dreyer's. Try putting tuna canned in olive oil (drain it a little) into a KitchenAid mixer with the paddle handle and just let it run on low for about 5 min. No mayo needed! I've also heard of people using mashed avocado in place of mayo (although it is a different taste,but more so for the texture)I bet mixing the avocado with dijon mustard would be good for tuna,potato or egg salads. I don't know if I would try it in a chicken salad that has grapes and apples though. Hey, Snack Girl, your tuna melt sounds delicious! Now,a tuna can is usually half tuna and water or oil. I crush up 4 soda crackers and mix with tuna (and oil or water) contents. That way it goes twice as far and you cannot taste the crackers. This sounds delicious! I have never been a fan of mayo though, so I always use mustard or spicy southwest mustard. It sounds weird but its actually really good. Main difference between mayo and Miracle Whip is Miracle Whip has high fructose corn syrup and sugar, which makes it sweeter. Tried this for lunch today, and both my husband and I really enjoyed it. The crunch of the pepper is really the perfect contrast for the soft tuna! I just made this recipe. I do admit to changing it just a bit. I had no scallions, only 1 red pepper, & thought I wanted just a few more flavors so I added just a smidgeon of yellow mustard & about a tablespoon of chopped sun dried tomatoes. This is sooooooo EASY & EXTREMELY YUMMY!! Thank you!! I have my ingredients all ready to try this for dinner tonight. However, since I hardly ever use mayo, I have no idea if the mayo in my fridge is any good. Hmmmm... I may be trying the greek yogurt idea sooner than planned. So, I made these last night and they were awesome! I used the yogurt instead of mayo and it really helped to lower the points. However, since I only had one pepper, I split the filling between the 2 halves instead of 4 (but with no mayo, the points were still okay). I used only one celery stalk too and no scallions. I will definitely make these again!! Very delicious. I love that the pepper gives a good crunch. I will never again eat a tuna melt with bread!! came upon this recipe on pinterest. i've made this (sans the cheese) the past three weeks in a row. i ADORE this recipe. have been doing my peppers on the grill. deeelish! I am totally making this tonight! Great recommendations everyone! I'm totally going to use greek yogurt instead of mayo and add some white onions and diced fresh jalapenos to the mix! I'm a little late to the party here...but I just stumbled upon this blog. This recipe is great! I just tried it a couple days ago and posted my version of it on my blog (with credit to you of course). Hope you don't mind. @Krissy - no, I don't mind. Thanks for sharing the recipe and I'm glad you liked it. I don't like peppers, but I will make these with TOMATOES. We have an abundance of tomatoes from our garden. Mmmmmmmmmm :-) LOVE it with tomato! I just saw a bag of mini bell peppers at Shaws over the weekend. I'm picking some up tonight! I have two red bell peppers sitting on my countertop and I am trying this for lunch today! Can't wait...I think my 5 year old will like this too. BTW, I agree with you that 1 TB of mayo is perfectly fine once and a while. With healthy tuna and veggies, why not! This recipe has become a weekly staple for me on my low carb days. The one substitute I made is the mayo. Instead, I use 0% plain Greek yogurt and combine it with some dijon mustard. I have even used canned salmon rather than tuna and sometimes add some diced avocado to the mix. This recipe is great no matter what you do with it. This looks amazing! What a healthy idea to replace bread with bell peppers - and, it sounds even yummier than bread! Genius! This looks DELICIOUS! I'm excited to have it for lunch tomorrow. I have been looking for some easy lunch ideas so thank you so much for helping us all! I now substitute Greek yogurt for mayonaise in all recipe.